Osteoporosis is defined as a medical condition in which the bones get weak and brittle due to loss of tissue, usually as an after effect of hormonal change, or insufficiency of calcium and vitamin D. The word osteoporosis is derived from the word “osteo” referring to bones and “porosis” referring to porous, resulting in weakness. Osteoporosis affects men and women of all races. White and Asian women, and especially older women who are past menopause are at the highest risk. According to statistics, women are more affected than men. As many as half of all women and a quarter of men older than 50 have fractures due to osteoporosis. There are several different treatments for osteoporosis, including lifestyle changes and a variety of medications. Osteoporosis has been diagnosed by a bone density study. Osteopenia (thin bones, but not osteoporosis) has been diagnosed by a bone density study, if a bone fracture has occurred. 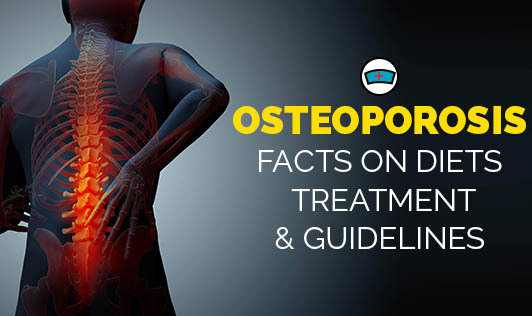 Drugs are used to prevent and treat osteoporosis. Calcitonin is a medicine that slows the rate of bone loss and relieves bone pain. It comes as a nasal spray or injection. It’s never too late to arm your bones against osteoporosis or strengthen them if it has already set in. However, it’s important for parents to know that building strong bones during childhood is truly the best defense against osteoporosis. Energy intake should be adjusted depending on a person’s weight in order to achieve a healthy and balanced weight. Eliminate processed meat, poultry, and dairy and replace with soy products, fish, or free-range organically grown animal meats and dairy. Protein is essential in our diets to build tissue during growth and to repair and replace tissues throughout their life cycle. It is also needed for bone healing and proper function of the immune system. So make sure to consume more cold water fish and legumes for protein. Avoid hydrogenated fats and oils as they convert to trans-fats which increase breast cancer risk. Get at least 800 to 1,000 IU of vitamin D3. Vitamin D helps your body absorb calcium. Apart from exposing yourself to sunlight everyday you can obtain vitamin D from egg yolks, saltwater fish, and liver. Supplement your diet with a properly formulated calcium formula. While this will not completely stop bone loss, it will guarantee that a supply of the materials the body uses to form and maintain bones is available. Eliminate artificial sweeteners and tobacco products. Eliminate or reduce consumption of caffeine, alcohol, high fat dairy, and chocolate. Lower your consumption of simple sugars- they promote sharp blood sugar fluctuations. Increase your intake of cruciferous and dark green leafy vegetables, legumes, and whole grains. Increase the intake of complex carbohydrates to 70% of your daily caloric intake. Consume smaller, more frequent meals or snacks. Never go more than 4 hours during any day or 12 hours overnight without food. Drink plenty of water- at least 8 glasses daily. Fluid restriction can be harmful. Exercise 30 to 40 minutes, 4 to 5 days per week. Learn to successfully manage stress. Avoid any exercise that presents a risk of falling, or high-impact exercises that may cause fractures.